This setting will apply to any events scheduled using share availability. A link to the email thread is not included in events scheduled using calendar invite (i.e., when you offer a single time to your recipient), because often the calendar invite used when multiple attendees are invited to the same event, each via a separate email. 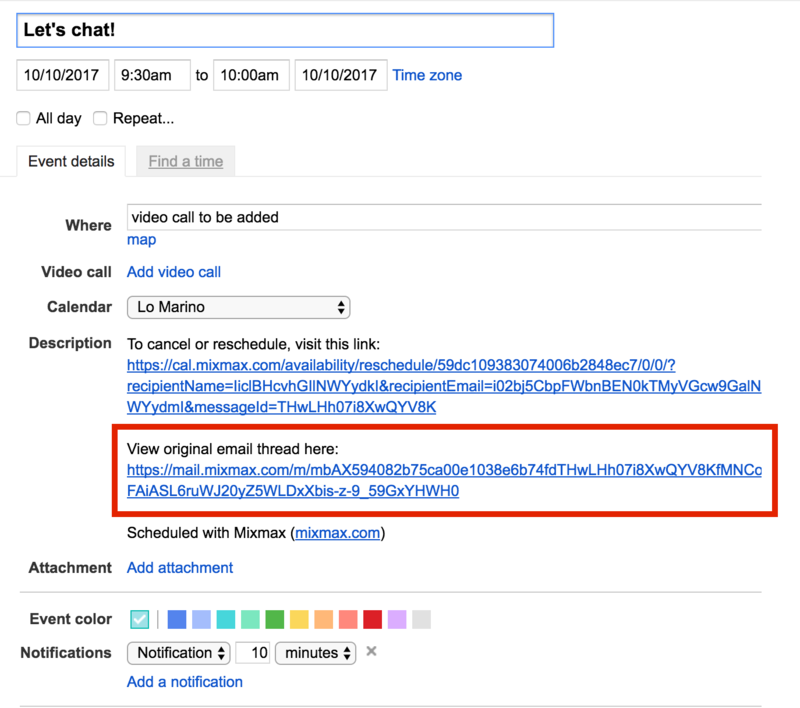 In this case, a separate link to the email thread cannot be added for each recipient, since all share the same Google calendar event. Each Meeting Template has a dedicated setting where you can choose whether to add a link to the email thread. This option can be found in the Options section of each Meeting Template, directly below the Buffer time. When these settings are turned on, a link to the original email chain will be included in the calendar event description. This link will point back to the specific email that resulted in the meeting being booked. The calendar invitation that gets sent to the attendees will also contain the mail link so they can view the message quickly. This is handy if you want to have more context about the meeting, without searching back through your email. This setting will be turned on by default when you're creating new meeting templates. If the setting is unchecked, the link to the email will not be included in the event description or the calendar invite.